Capture the classic spirit of life in France by riding around on a vintage 1960’s moped in true style. It’s the ultimate way to discover Lyon’s streets and neighbourhoods with the wind in your hair and without wearing your shoes out. The advantage with the Solex is that with its top speed of 30km per hour you can zip down Lyon’s small streets with ease or simply turn the motor off and pedal your way down any lanes designated for bicycles. One company offering guided group tours of Lyon on a Solex 3800 is “Le Brélon de Lyon”, which has been around since 2012. They require a 2 person minimum or 10 person maximum for your group and have three suggested routes. The shortest is a one and a half hour tour of La Croix Rousse and costs 35€ per person. A longer two hour which descends from La Croix Rousse to Place Bellecour costs €45 and if you feel like a stop for lunch, their longest guided tour of two and a half hours costs €50 (lunch not included) All tours offer a quick training course to make sure you’re feeling safe and then you’re on your way. Le Brélon de Lyon 20 Rue Burdeau Lyon 69001. Telephone 06 51 70 02 98. Their workshop and rental office is located on the slopes of La Croix Rousse about a 10 minute walk up from Place Terreaux. They are open from Tuesday to Saturday from 9am to 12pm and 3pm to 7pm. Reservations are required in advance. Riding a Segway is intuitive and easy to learn. It’s a 2 wheeled self balancing motorised vehicle which you stand upon and operate by shifting your weight on the small platform. It’s another great way to visit much of Lyon without walking miles and with the added bonus of a little more speed. 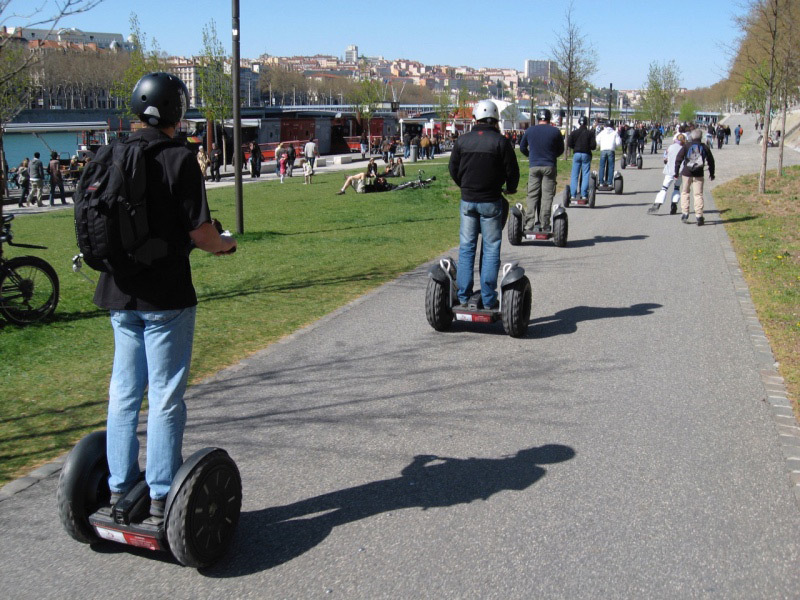 The Lyon company “Comhic” is a Segway dealer which also offers guided tours of Lyon. They have several tours available starting with a one hour tour along the banks of the Saone which takes you past Les Subsistences, which started life as a 17th century convent and which is currently used for artists. This short one hour tour includes a 20 minute training course and then you’re rolling! The cost is 32€ per person. They have a two hour tour which takes you from Place Bellecour to Park de la Tete d’Or and along the banks of the Rhone and this costs 52€. The Comhic “Grand Tour” (minimum 4 people) lasts three hours and takes you all over Lyon starting in the new Confluence area and taking in Place Bellecour, Place Terreaux, La Cité Internationale and the St Paul neighbourhood. The price for this tour is €72. Comhic also offers tours on electric bicycles. Comhic 7 quai Romain Rolland, Lyon 69005. Telephone: 0472654386 / 0607330765. Their office is located on the right bank of the Saone in Vieux Lyon. It’s just north of the grand Palais de Justice and across the Pont du Maréchal Juin bridge from the center of Lyon. For a more traditional 2 wheeled experience, Lyon Bike Tours offer guided tours of the city on an electric bicycle. Lyon is a bike-friendly city with an extensive network of paths and trails and electric bikes are fun for all the family. It’s a great way to visit Lyon and cover a lot of distance in relative ease and comfort. The company offers several different tours starting with their 90 minute “Gones” Tour which follows the banks of the Rhone, passing through Parc de la Tete d’Or and Vieux Lyon. There are longer tours of 2 or 3 hours that can include a stop for a bite to eat and even an evening tour which visits some of Lyon’s beautifully illuminated buildings, bridges and monuments. Prices start from €30 per person. Reservations are via the website or by calling 06 51 36 33 47 or email: [email protected] After making a reservation your tour begins by meeting your guide at 23 Quai Roman Rolland which is on the banks of the Saone in front of the Palais de Justice in Vieux Lyon. From here your guide takes you to your bike and you’re off. There are bikes for children and seats available for the very little ones. Helmets, a water bottle and raincoat (just in case) are supplied and your guide speaks english. Have fun! elit. et, ut diam amet, nec Praesent quis neque.